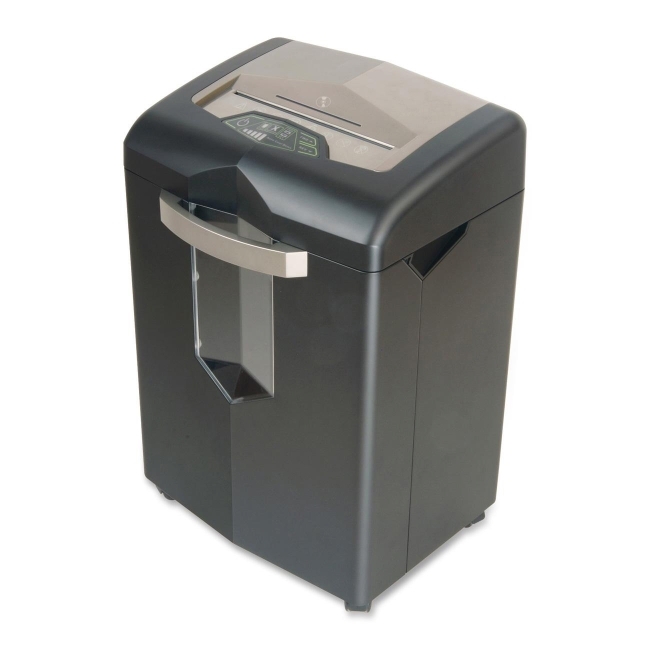 Medium-duty, cross-cut shredder features anti-jam technology, overload protection and built-in thermal protection to prevent the system from getting dangerously hot. Jam-Stop Auto Reverse Technology prevents jams when trying to shred too much paper. Easy paper removal with no down time increases productivity. WhisperShred Technology reduces decibel levels so you experience a low noise level (58 decibels) whether running idle or shredding paper. Totally enclosed gear box helps reduce noise and prevents failure from dust and debris getting into the gears. Shredder also cuts 17 sheets of 20 lb. paper into 5/32" x 1-3/8" pieces (Security Level 3) at 7-1/2' per minute with a 25-minute continuous runtime. Shredder also shreds CDs/DVDs, credit cards, staples and paper clips. 7.1 gallon pullout waste bin allows easy waste disposal. Clear window on waste bin shows the fill level. Design also features an LED standby light, 9" entry width, and automatic start/stop. Shred Size: 5/32" x 1 3/8"